Often in community development work we focus on the big things – the massive ideas that will transform the local economy, the construction of classrooms or strategies for improving local human rights. The challenges are not small, so our work efforts expand to meet the needs – we make our best, biggest attempt, anyways. Today I was thinking of the small things. We started a school last year. It took the better part of the year to secure the land, design and build the school, decide on curriculum and recruit teachers. I got to make one small decision – the color of school uniforms. Most of the students in Burundi wear khaki uniforms, but technically olive green and blue are also acceptable options. Khaki – the color of the dry dirt that covers the hills of this community and a drab green were immediately ruled out. I wanted bright blue for these boys and girls, vibrant and saturated with life. 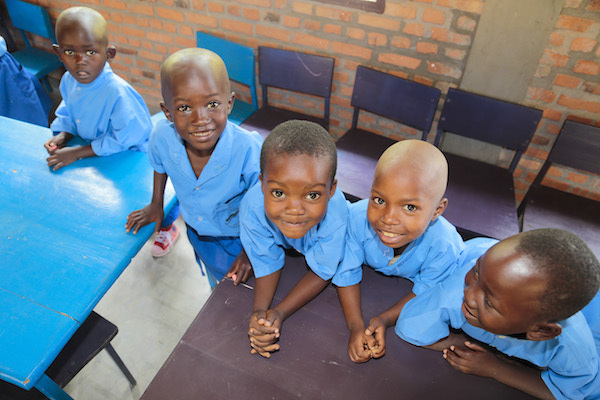 Bright blue uniforms for kids with bright futures. It’s a small decision, but not insignificant.